If you’re looking for inspiration for a tasty and easy meal to share with your family this Easter I have some simple suggestions for you. There’s a creamy Celery Soup for starters, followed by Slow Cooked Leg of Lamb with a Ruby Grapefruit and Asparagus Salad and Hasselback Potatoes, and Hot Cross Bun Bread and Butter Pudding for dessert. If you’re vegetarian or vegan I’ve added some tips and twists in for you too. Then all you need are a few drinks, some family or friends, some music and some relaxation time. Easy! Just click on the link to access each recipe. Soup: Cream of Celery Soup Recipe This is a super-healthy and totally delicious soup that is also useful for boosting your immune system and warding off colds and flu bugs. It makes a lovely first course and is gluten-free and can easily be made as a vegan dish. Note: If you couldn’t be bothered with a big meal or you’ve eaten too many Easter Eggs why not have some cheese, crackers and fruit as your first or last course and pair that with this soup. Make sure you have some good bread to go with the soup – you’ll find it tasty and satisfying. This is a scrumptious and very pretty salad and the acidity of the grapefruit goes well with the richness of the lamb roast. Vegetarian? Throw in some extra avocado and feta cheese, double the size of the salad and forget about the lamb roast. Make sure you have some yummy bread as an accompaniment. A good rye bread or grainy sourdough is a great choice for this salad. Vegan? See tips for vegetarians and omit the feta cheese. Carb:Hasselback Potatoes? Opera House Potatoes? Best Ever Baked Potato Recipe! This potato recipe is a favourite in our household and I will often make them for special occasions or when friends come to visit (which is often for us because we are blessed with good friends and good neighbours). They are crunchy on the outside, soft in the middle, and you won’t be able to stop at just one! Easter and Lamb Roasts go hand in hand. This is a simple recipe – it takes little effort and the results are always a show-stopper. It’s a moist, flavour-filled, melt-in-your-mouth dish that is easy for beginner cooks. It’s almost impossible to stuff up. But you do need five hours of cooking time, and fifteen minutes prep, as well as fifteen minutes to rest the roast after it has cooked. Totally worth the wait though!!! Note: Sorry, vegetarians and vegans. If meat is not your thing I have no substitute for this one. This pudding is made several times over the Easter period in our house, as it’s so simple and easy for feeding guests and we don’t seem to tire of it either! It’s a silky smooth bread pudding with a lightly spiced sweet custard – heavenly! Note: Choose gluten-free buns or bread it needed. You can also use your favourite type of non-dairy milk, a butter substitute, and if you need to be egg-free replace the eggs with one cup of applesauce. Nicole could not come to write her blog post today due to lack of stable internet connection, but sends her love with top five comfort soup recipes from Cauldrons and Cupcakes to warm your hearts. “The beauty of this soup is that it’s a bone broth, and over time all of the fat and water soluble minerals and good bits dissolve into this magical elixir. One of the things this soup is chock full of is glycine. The amino acid glycine is great for liver detoxification and regeneration. Chicken soup is rich in collagen and glycosaminoglycans (GAGs), one of which you’ve probably heard of – glucosamine – stunning for artery, bone and joint health. The gelatin produced from dissolving bones and cartilage in the making of this soup helps heal leaky gut, and also reduces your need for meat and protein. I lived on this soup when I was a university student, back in my sharehouse days, and then again when I bought my first house and every spare cent went on the mortgage repayments. 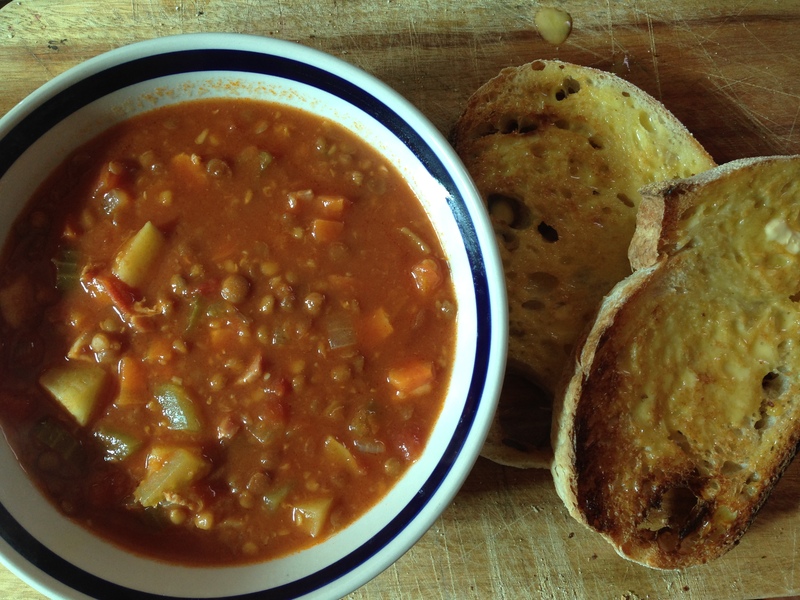 I used to make this soup because it was yummy, filling and cheap. Then I began to make it because it was yummy, filling and so easy to prepare from just a few frugal ingredients – great when I was busy and time poor. Then I made it because it was wholesome and health-promoting, and even on my worst health days I managed to be able to put the ingredients into a pot somehow. This is a hearty soup, and by the end of cooking the meat will be falling off the bones, and the bones will have given all their goodness to the broth. This is the fastest way I know to make a bone broth! Over the years it has become an important recipe in my kitchen. It’s one of the soups I’ve made in bulk and frozen, for Ben to reheat for me when I come home from hospital. It’s easy enough that when we run out of frozen soup, Ben will have no trouble in whipping up a fresh batch for me as I talk him through it. Let me show you how easy it is, so that you can make it too. * Note – organic chicken wings, like all chicken wings, are always heaps cheaper than the more expensive cuts of chicken! o if you’re going organic, this is a budget friendly way to do so. If you have other vegetables you’d like to throw into the soup, go right ahead. It’s a very accommodating recipe. Place a slug of oil in the bottom of a large heavy saucepan over medium heat. Brown the wings until they are still raw, but have taken on a nice golden colour. You may need to do this in batches. Remove wings from pot and set aside. While the wings are browning, chop your onion, celery and carrot into a small dice. Mince the garlic or chop finely. Cut the potato into slightly larger chunks so that it doesn’t fall apart in your soup. Place the onion, carrot, celery and garlic into the pan and stir on medium heat for a few minutes until they are fragrant and beginning to brown slightly. Add the chicken pieces, bay leaves, potato, and oregano into the pot and then pour the water over. Add a grind of pepper, a pinch of salt, your stock cube or powder, and a squeeze of lemon juice (or a dash of vinegar – about a tablespoon is good). It won’t look very exciting yet. It takes time for the magic to happen! Bring to the boil, stir, and then turn the heat down until the liquid is simmering on a very slow boil. You still want to be able to see some action in the pot. Don’t turn it down so low that nothing is happening! Place a lid on the soup but make sure it is vented. I usually place my lid cocked on the rim, so that it is partially covered but steam can still escape easily and the liquid will reduce a little. Or, leave the lid off, but watch your soup so that the liquid level doesn’t drop too low. If it does, no drama. Just add a bit more water. Leave the soup to simmer for about two hours. Do check it occasionally in case you need to stir it or add a little more water. About ten minutes before serving use a sharp knife to cut the kernels from the cob of corn. Add the corn and freshly chopped parsley to the soup. Let this cook for ten minutes and then taste. Adjust the seasoning by adding more salt and pepper if necessary. Another little squeeze of lemon juice can also really lift the flavour. Ladle into bowls and enjoy. This was one of the first things I ever learned to cook. My Nana taught me in her little kitchen. I was still so young that Pa had to bring an old wooden crate upstairs for me to stand on so that I could reach the bench and the stove. Nana called this ‘Mum’s Soup’, and it is one of the easiest, heartiest and most delicious meals I know. It is comfort in a bowl, and it’s also economical. For Nana, who grew up during the Depression, a meal needed to be economical or it was forever off the menu. There was never any kind of written recipe for this soup. It’s the sort of thing you throw together by eye, with simple kitchen staples. It’s a recipe that is passed from mother to child by word of mouth, and shared hours bent over chopping board or simmering pot. This takes less than ten minutes prep, and then two hours cooking time. The soup freezes well, and will keep in the fridge in an airtight container for five days. Serve it on its own, with crusty fresh bread, buttered toast or a big salad. 1 cup of diced bacon or speck (or a ham hock), 1 large onion, 2 carrots, 1 large potato, 2 to three ribs of celery, two litres of water and one to two stock-cubes or teaspoons of stock powder – or use 2 litres of homemade stock or bone broth, 1 cup of dried soup mix (which should contain a mix of things such as pearl barley, lentils and split peas), 2 large bay leaves, olive oil, a 1/2 teaspoon of dried oregano, salt and pepper to taste. *Optional but good – the kernels from a fresh cob of corn, a tablespoon of chopped fresh parsley. **Make sure to have a little extra water on hand in case you need it. Set your corn and parsley aside for now. We’ll add them later. Chop all of the vegetables and bacon into small pieces. It’s fine for your dice to be a bit rough. After all, this is a rustic, homestyle soup. I have used a piece of speck instead of bacon in this recipe. It’s not quite as salty or as fatty as bacon. But just use whatever you have to hand. Make sure to remove the rind and discard it when you are cutting up the meat. Pour a slug of good olive oil into the bottom of your big heavy-bottomed soup pot and place the pan on a medium heat. Throw in all of the vegetables and bacon pieces, and fry off until they have softened, are fragrant, and have coloured up a little. This brown caramelisation makes a big difference to the end flavour. Make sure you have picked over your dried soup mix and removed any stones, badly shrivelled items or foreign material that may have found its way into the mix. 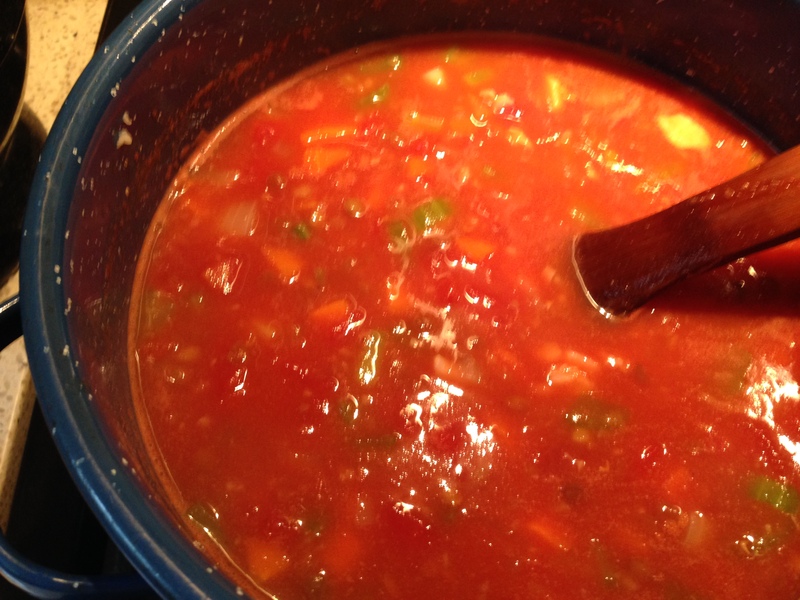 Throw your soup mix into the pot and give everything a good stir for another minute or so. Then add the stock, or water and stock cubes. Chuck your bay leaves in too. Bring to boil and then take it back to a slow simmer. It won’t look very exciting yet. But that’s okay. Cook for one and a half to two hours.Stir occasionally. About fifteen minutes before you want to serve the soup, slice the kernels of corn off the cob with a sharp knife and finely chop your parsley. Check that all other soup ingredients are soft. If not, let them cook a little longer. Add the corn and parsley to the soup if you’re using them. If the soup is very thick, add in some extra water. Stir well. Cook for a further ten to fifteen minutes on simmer. The corn will retain a pleasing crunch, adding a lovely texture to the soup. If you are using a ham hock, use tongs to carefully lift the hock from the soup pot. Carefully shred the meat off the bone with forks, and add it back into the pot. Fish out the bay leaves. You’re finished with those. This quick and easy soup is one of my all-time favourites. It’s healthy, and you can throw it together in a couple of minutes. Perfect for when life is crazy-busy, or when you’re tired and need an easy meal. Optional extras: 1 teaspoon of toasted sesame seeds, a teaspoon of dried soup seaweed, a dash of soy sauce or braggs amino acids, a tablespoon of finely chopped spring onions or coriander (cilantro). Note: If you have a good Asian grocery store nearby they may have ready-made jars of rice seasoning sprinkle which will have sesame seeds, seaweed and other yummy flavours to make your soup fun. Put stock into a saucepan and add noodles. Bring to boil. Reduce heat to medium. Throw in protein if raw. Cook for one minute. Throw in vegetables and any cooked protein and cook for one to two minutes. Place the spoonful of miso in the bottom of your serving bowl. Add a little of the hot broth, and stir well. Pour soup into bowl. Add sesame seeds and other flavourings if using. The weather has turned cold here at the farm. My two dozen Brunswick Heads oysters freshly shucked on their half shell (from Noel at the Mullumbimby Farmers Markets) suddenly seemed unappealing, given the weather. All I wanted was soup. Solution? A creamy oyster chowder, brimful of flavour and warming to the belly. This recipe can be made with freshly shucked or bottled oysters. It will make two hearty serves, or four smaller serves as a starter. The chowder can easily be made gluten-free by choosing an appropriate gluten-free plain flour, and dairy-free by substituting soy or rice milk, using a butter substitute and omitting the small amount of cheese. 2 dozen fresh oysters and their liquor or the equivalent in fresh bottled oysters and liquid, 1 small onion, 1 large rib of celery, 2 large rashers of bacon or 1/2 cup of diced smoked ham, 2 tablespoons of butter, 2 tablespoons plain flour (or your favourite gluten-free flour) 3 cups of milk or your favourite milk substitute, 1/2 cup of fresh peas or corn, 1 medium potato – washed, 1 tablespoon of dry sherry or dry white wine, 2 tablespoons chopped fresh parsley, 1 tablespoon grated parmesan cheese, 1/2 teaspoon smoked paprika, Tabasco sauce, salt and pepper. Note: This is a forgiving recipe. Feel free to pad it out with a few more garden vegetables, a little extra butter, flour and milk and a dash more cheese. It’s also fine to add a little more bacon or ham. That won’t overpower the oysters. Finely chop the onion and parsley. Dice the celery, potato and bacon or ham. Prepare the peas or corn. We are blessed with a bumper crop of peas this year, so I shelled a few handfuls (and ate quite a few too!). Corn straight off the cob is also a delicious addition to this soup. 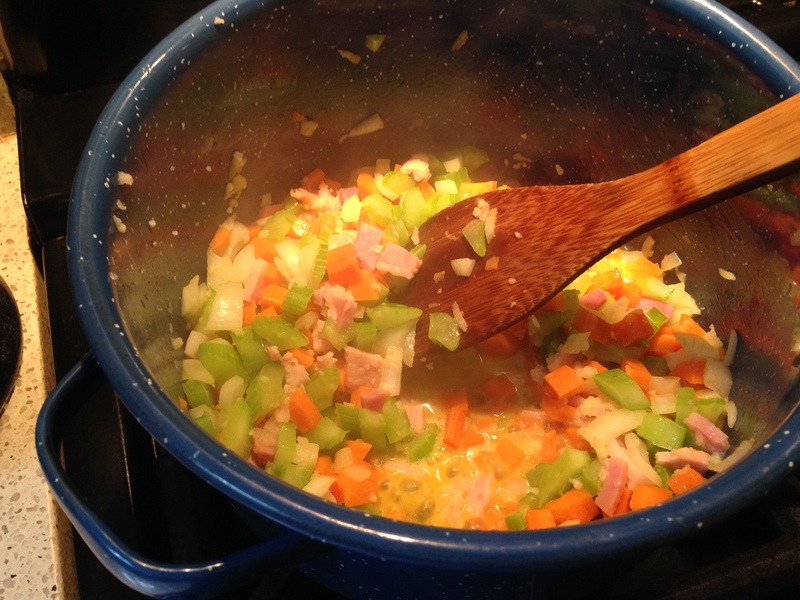 Place the butter, celery, onion and bacon or ham in the bottom of a large heavy-based saucepan over medium heat. Stir well until butter melts and the onion becomes translucent and fragrant. Dump in the flour and stir until combined and thickened. Reduce heat (or temporarily remove from heat) and add milk a little at a time, stirring well to avoid lumps. When all the milk is added and the mixture is smooth, return to medium heat, and dump in the potato, peas or corn. Cook for five minutes or until potato is soft. Now add the oysters and their liquor, the cheese, sherry or wine, parsley and the smoked paprika. Cook for a further five minutes. Add a dash of Tabasco sauce if you like it spicy, and adjust the seasoning by adding salt and pepper to your taste. I find this recipe tastes best with a generous pinch of salt! Serve in deep bowls with hot buttered toast. Sunday or Monday is usually a day of planning and prepping for me. And that often includes making a batch of Last Chance Soup. 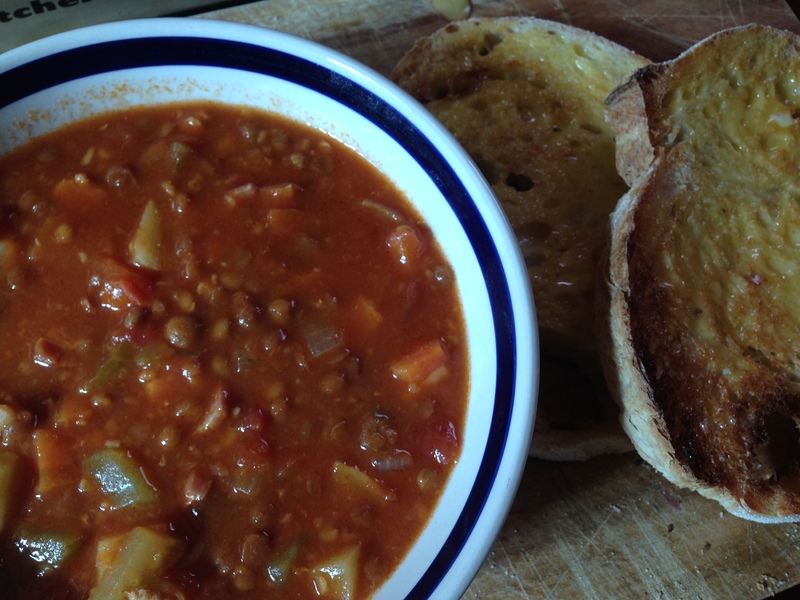 I first started making this soup when I was an impoverished student, living away from home in a share house. We went to university in a rural town where we were fortunate to have good access to cheap fresh produce. I would buy whatever was in season at the big roadside produce stalls and ask for the old and damaged fruit and vegetables, which the stallholder would often give to us for free or at a vast discount. We were always broke and I needed to make our food budget stretch as far as I could so we would have enough money for important things, like books, rent, and beers on a Friday night. Growing up, I’d done the lion’s share of cooking at home because mum worked long hours. Later, I often shared with housemates who couldn’t cook, so I never minded volunteering for the cook’s position. There was method to my madness too. We all chipped in a set amount per week for food. If I shopped and cooked I used from-scratch ingredients, which were cheaper that freezer meals and junk, and that way I could even make cakes and biscuits for the same amount of money as the sad traditional student diets of instant noodles, frozen pizzas, things in cans and microwaved meals. In the end, for being impossibly broke, at our house we ate really good food – roasts and soups and stews, cakes and puddings and sweet treats. I was determined to live well, even on a shoestring. I knew it could be done. My grandmothers had taught me these things, after having themselves grown up in lean times. Eat simple. East seasonal. Eat local. Grow what you can, and support the farmers who live nearby. Wherever I lived I had a few battered recycled pots and styrofoam boxes or roughly-hewn garden plots for my herbs, flowers and easy-to-grow vegetables. We were sometimes blessed with a gnarled old lemon tree or two in the back yard, or we’d find someone who did. My grandmothers were my introduction to the slow food movement before such a thing was even a movement at all. Essentially, this soup is a throw-together of what’s in the fridge at the end of the week that is needing to be used up or thrown away/composted/fed to the chickens. Hence the name Last Chance Soup. Because left-overs vary from week to week the flavour changes with each batch. I use up the last of any cold roast meats or tail ends of bacon etc, or perhaps a little fresh meat or chicken. Sometimes I’ll use beans or lentils. It really does depend on what is in the fridge, freezer or pantry. If I use beans or lentils I may throw in a tin of tomatoes and some tomato paste. Then I go through the onion and potato bin, and the crisper drawer. Have a look at what’s in the garden. Anything that is old or a bit wilted gets used up. Leftovers from previous meals? They may work too! After a few minutes of chopping and another hour or two of simmering I have a lovely pot of soup that I can eat for a simple Sunday night dinner, with enough left over to freeze into portions for easy meals, a quick lunch, or an emergency gift for a hungry or stressed friend. An onion, a clove or two (or three!) of garlic, two litres of stock or bone broth, a few cups of mixed vegetables (sometimes I’ll use cold roast or cooked vegetables from a previous meal), a handful of fresh or a pinch or two of dried herbs, a cup or so of raw or cooked meat or beans/legumes. Salt and pepper to taste. Adjust the quantities up or down as needed. Additional flavourings can be had from tomatoes and tomato paste, lemon, dried or fresh herbs, curry powder, a glug of wine, sauces or preserves. You could also add a handful of dried pasta or a little rice for extra body and texture. Can I be more specific than that? Not really. I’m not sure what’s in your fridge or pantry! For this particular batch of soup I used 3 garlic cloves, one red onion (starting to shoot! ), 2 carrots looking past their prime, the last of last week’s bone broth, plus water and a little vegetable stock powder, 2 big rashers of bacon and half a chicken breast, 2 soggy sticks of celery and the tops of the new bunch, 2 very small dutch cream potatoes that won’t be useful for anything else, the remainder of an old pumpkin, 1 big green leek, the sad remains of a once huge cauliflower – the stalk and maybe a cup of florets, a big handful of fresh parsley from the garden, a couple of green onions, the pitiful last squeeze of half a lemon I’d already used for something else, a heaped teaspoon of turmeric, a tablespoon of coconut oil (or your favourite fat). Chop the onion, garlic, meat and leek into small pieces. Heat a big pot over a medium flame, add the coconut oil and then toss in the meat, leek, onion and garlic to brown and cook. Stir often. You can then throw in the turmeric, celery and carrot to brown up a bit too if you want, as this gives the soup a richer flavour. No time? Don’t worry – just chuck it all in. Add the rest of the vegetables or beans/legumes if you are using them, and any dried herbs. Keep fresh herbs and any especially soft and quick cooking vegetables, like small pieces of pumpkin or zucchini, aside until the last ten minutes or so of cooking time. Pour in the stock. Stir well, bring to a strong simmer and then reduce heat and simmer for one to two hours, covered. Taste, and adjust if necessary using salt and pepper or a dash of anything else that takes your fancy. It’s fine to add in a little more water or stock too. To finish, throw in the finely chopped herbs and any remaining vegetables and cook on low heat for another five to ten minutes. The humble ingredients will have then transformed into something satisfyingly magical. Ladle into a bowl and enjoy. I jazzed mine up with a few shavings of parmesan cheese and some extra fresh herbs. Result? Delicious! *Note – if your soup ends up very thick, feel free to call it stew and serve it over rice or noodles, or with some thick slabs of toast. Be creative! At the local farmers’ markets on Friday I bought two dozen small sweet fresh oysters on the half shell. I ate a dozen that day, and kept some over to make soup. The local oyster growers, who farm the Brunswick River, are ecstatic that this Spring has been so dry. No rain means that the salinity levels near the mouth of the river are high, and the oysters are thriving, growing plump and fat quicker than ever! The taste marries earth and sea, and the simple flavours are quite hearty. Happily it is also low in fat, carbs and calories, while being very nourishing. It’s the perfect kind of meal for me right now while I’m weathering my two days of horror Lyme drugs. And it’s delicious, too. Note – I also sometimes throw in a little fresh ginger too! Place stock in a saucepan and heat over a medium flame. Add chopped vegetables and garlic, and cook for three minutes. Add oysters and any liquor from shells and cook for another two minutes. Now add soy sauce, sherry, salt and pepper. Ladle into serving bowl and top with freshly chopped herbs. Enjoy on its own, or with some good bread. Soup is one of those all-time comfort foods for a very good reason. Problem is, so many soup recipes take hours to cook. That’s why I love this one. It’s fast to make, economical, and entirely delicious. It takes less than ten minutes to prep the soup ingredients which magically merge together in just twenty minutes cooking time to produce a hearty, nutritious meal in a bowl. Note: For a vegetarian/vegan soup, omit the bacon and substitute vegetable stock. 2 large rashers of middle bacon, 1 x 400g tin of organic lentils – rinsed and drained, 1 x 400g tin of diced tomatoes, 3 cups of chicken stock/bone broth (or use a stock cube/stock powder if that’s what’s in the cupboard), 2 ribs of celery, 2 carrots, 1 medium potato, 1 onion, 3 cloves of garlic – chopped finely or put through a garlic press, 2 tablespoons of tomato paste, 1 heaped tablespoon of butter (or olive oil or fat of your choice), salt and pepper. Note: Using butter gives an extra creamy richness to the flavour of the soup, and helps you to absorb all those good fat-soluble vitamins and minerals. Chop celery, carrot, onion, and bacon into small pieces. Add to large saucepan with the butter and garlic over medium heat and stir until fragrant.Then add lentils and stir well. Add tinned tomato and stock, the diced potato, and the tomato paste. Pop in a pinch of salt and a grind or two of black pepper. Bring to the boil and then reduce heat to medium and cook for twenty minutes or until vegetables are soft. Serve with some crusty bread or hot buttered toast. The soup will keep for five days in the fridge, and freezes well. Soup is such an easy meal to whip up, and it makes for handy left-overs too, for those other times when you want to eat well and fast. This weekend, between napping and being at Bluesfest, I need meals like this! This gluten-free quick soup has an earthy, satisfying flavour, and can be modified to suit vegans, vegetarians and people following dairy-free diets. 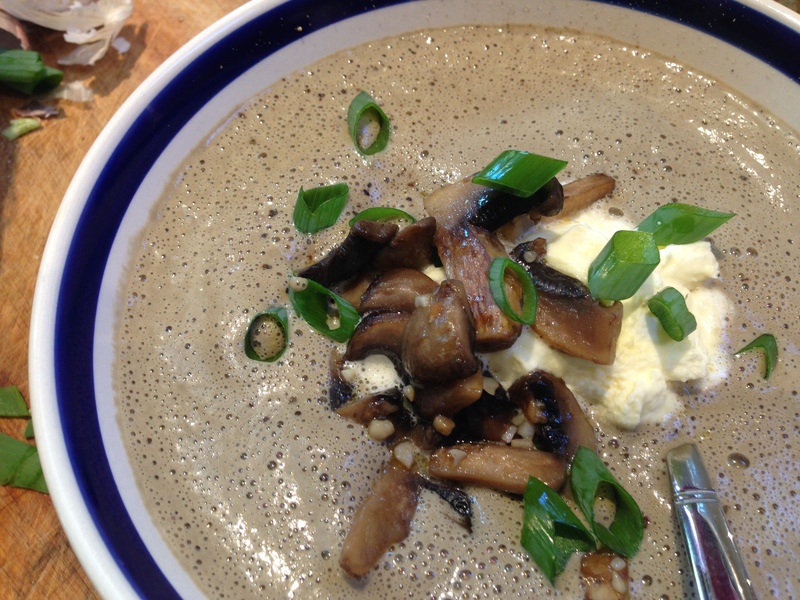 The mushrooms give this soup that rich earthiness. 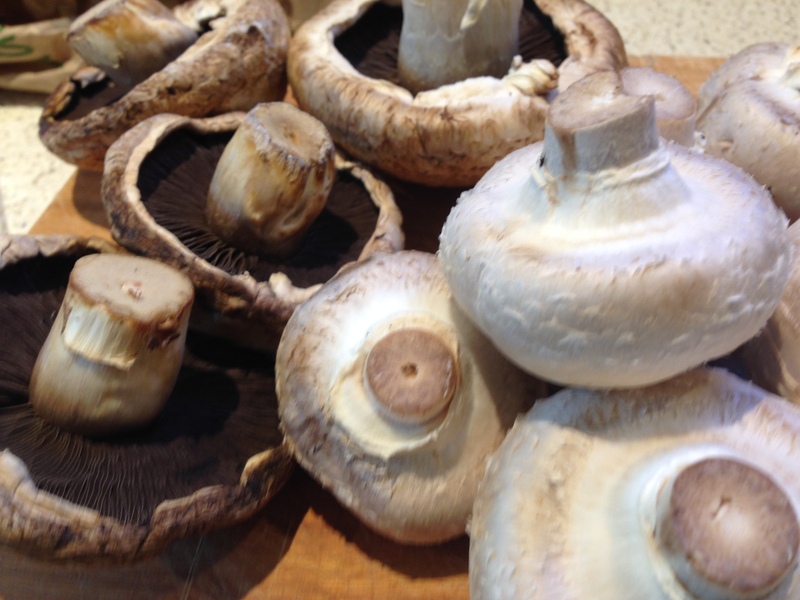 Try not to use just button mushrooms, as they have little flavour. The walnuts add protein and a hearty, creamy texture to this soup. I use good quality home-made chicken stock, but any good stock or bone-broth will do as your soup base. Obviously, if you are vegan or vegetarian use vegetable stock. Serve this soup with a salad, some crusty bread or toast for a filling and nutritious meal. 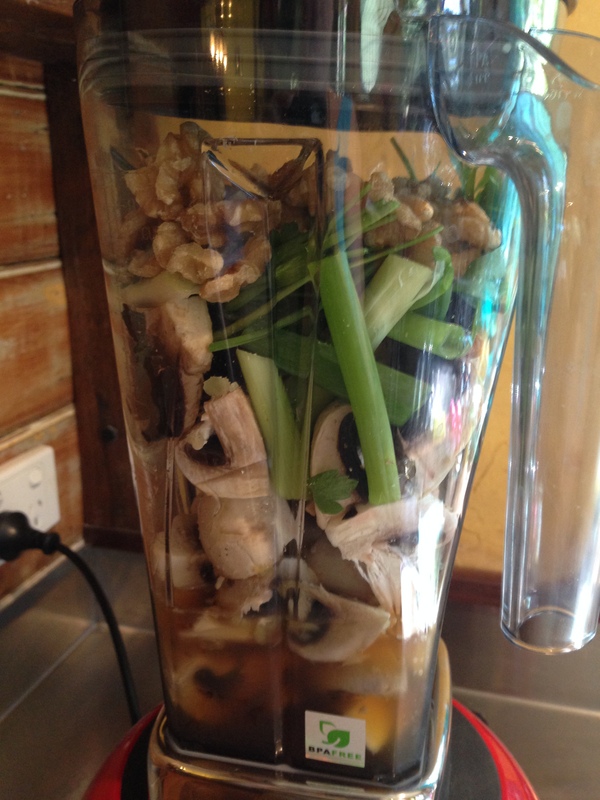 2 cups of good quality chicken stock (or vegetable stock for a vegan/vegetarian option), 1/2 cup of milk (or soy, rice, almond etc), a dash of Braggs Amino Acids or a splash of Tamari (gluten-free soy sauce) 5 heaped cups of sliced assorted mushrooms, 1 cup of walnuts, 1 fat clove of peeled garlic, 2 tablespoons chopped fresh parsley, 2 large green shallots (scallions/spring onions), salt and pepper. One large cup of sliced mushrooms, a knob of butter or slug of oil and one more crushed garlic clove, plus some additional finely sliced green shallot and cracked black pepper to serve. Some creme fraiche, sour cream, cashew cream or coconut cream to dollop on top of soup. Note: To fancy this up add one tablespoon of sherry at the end of cooking. Not necessary but certainly enhances flavour, giving an extra dimension of sweetness and depth. Place stock, mushrooms, chopped garlic, and herbs in saucepan. Add a little pepper and salt. Bring to boil and then reduce heat and simmer ten to fifteen minutes or until mushrooms are tender. Add walnuts and milk. Use an immersion (stick) blender to blend soup until smooth, or cool soup slightly and run through a blender or food processor. Do not boil once milk has been added or soup may curdle. This is how I made my batch of soup, using my new Blendotherm. A minimum of fuss and eight minutes from start to finish. Add liquid ingredients first, and then all others. Select soup setting and leave to cook. 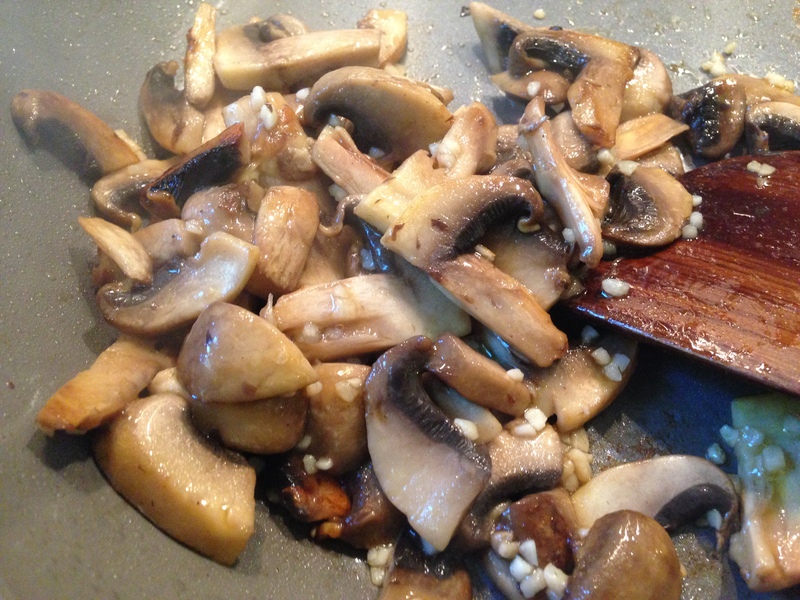 Add sliced mushrooms, butter or oil, and garlic to a pan and stir for a minute or two over medium heat until done. 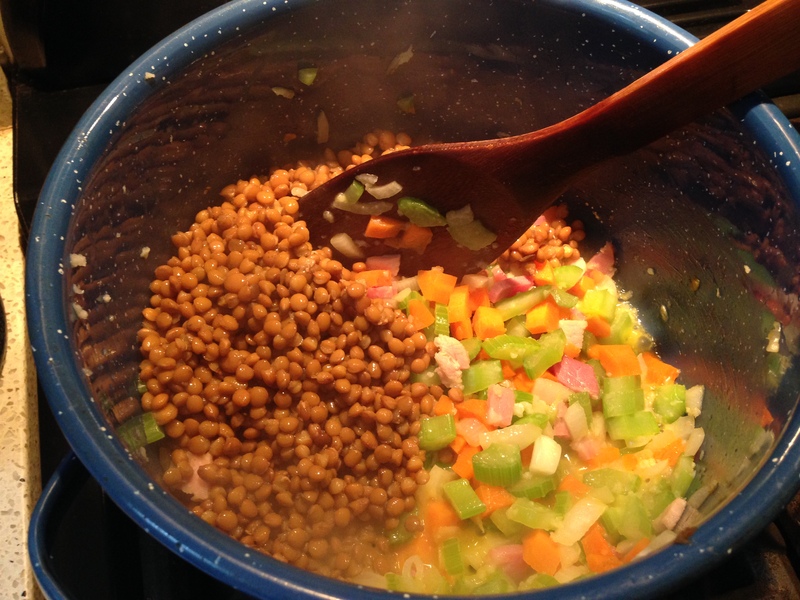 Adjust seasonings to soup, add sherry, and pulse or stir briefly to allow ingredients to mix thoroughly. 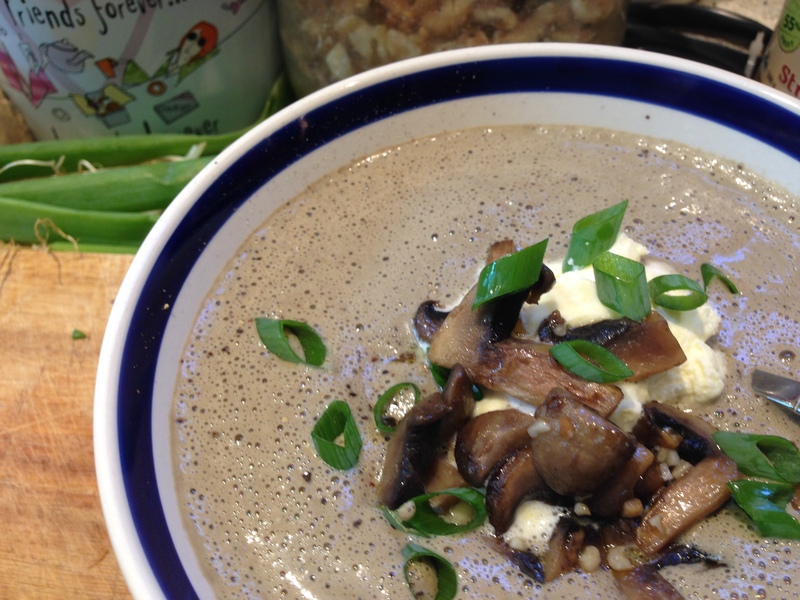 Serve soup with some sliced mushrooms, a sprinkling of green shallots or herbs of your choice and some cracked pepper. It’s also lovely with a swirl of your favourite cream on top too. Soup will keep for up to five days in fridge or may be frozen and reheated.